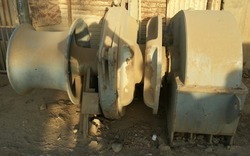 Supplier of all types of 4 Point mooring winches. - Size: 24", 20" 18" 16", 12"
we are engaged in offering wide range of special purpose, Passenger Double Drum Winch Machines. These are perfect for various heavy-duty applications as because they are durable in construction. These double drum winches are available at most reasonable prices, easy to operate, high in efficiency and low in maintenance to our valiable client. We are engaged in offering our clients with a comprehensive range of Piling Winch, which is widely acclaimed for its unique design, trouble free service & robust construction. These Piling Winch are offered with cone clutch for easy operation and carbon steel shaft.